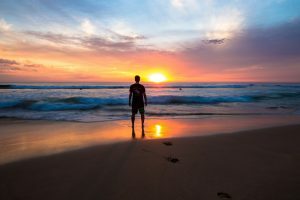 It seems like for me, and I imagine a lot of other folks, that when times of trouble come, and they do come, my practice of faith gets neglected. I tend to pray less or not at all, I fail the fast, my temper is shortened and it boils my blood as I practice loving myself more than others, and I hide in the shadows of the world binding my wounds and feeling forgotten and abandoned by God! Where is my faith? Where is my salvific practice? As I stand on the bow of Orthodoxy sailing Eastward, I try to reflect upon my past struggles and thank God that He did not forsake me. I was not always able to see Him in the midst of the storm but at some instant when I quit panicking and surrendered my quest for control and then started my return back to the practice of faith that we Orthodox know, His loving presence was evident and had been there all along! I had doubted God, but He had not doubted me! We hear the word “doubt” in the Gospel reading this morning. The Greek word for doubt here in the Gospel means wavering or hesitation. 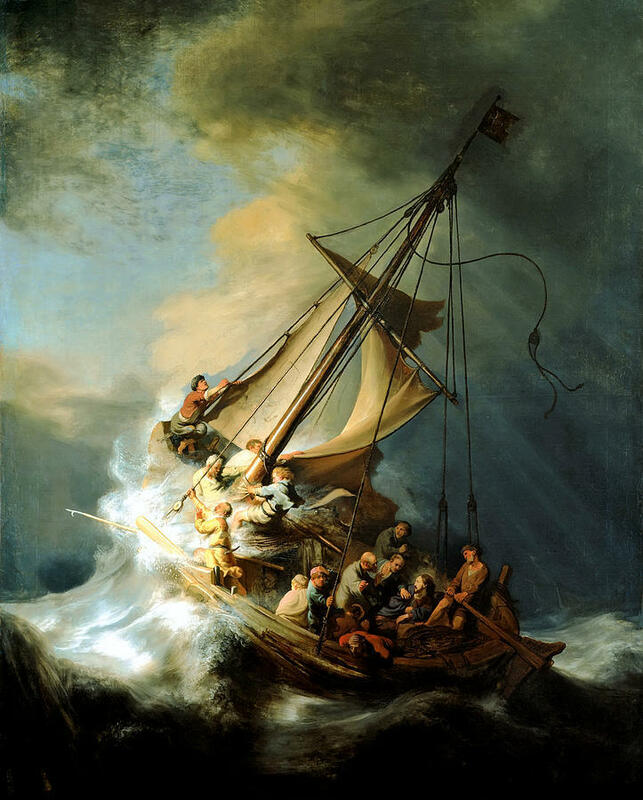 Peter sailing through the lake in the midst of a mighty storm began to waiver (Matthew 14:31). Our Lord was not visibly with him and Peter doubted, just like we do when a test comes. Just like we do when we find ourselves in an unfamiliar situation or a trial of our faith and we ask ourselves, where is God? Why am I alone? And then in the fourth watch Jesus appeared. The Fathers explain that there are four steps to His divine mercy: in the first watch of the night God sent the Law to Israel; at the second watch, He sent the prophets; at the third watch, He gave His Son to the world; at the fourth watch of the night, when we are doubting and ready to give up, He comes back in glory to lead us into His Kingdom. O thou of so little faith, why do you doubt? Do you not know that you are deeply loved? Glory to Thee, O Lord, Glory to Thee! One for all and all for One we shouted joyfully as we kids went off on our banana bikes and our very next adventure. Maybe trying to somewhat mimic the Three Musketeers in our time together, but definitely claiming to be inseparable and watching out for each other! We were brothers of some type of order or a secret promise made and solidified with our blood brother hand shake laced with spittle and dirt. We were discovering the unknown and trying to comprehend our existence. And folks knew if you messed with one of us you would be surrounded by all of us! It is against our blood brother and sister commitment or our promise to the ancient tradition of the church to divide this body of believers by any means as we find in the instructions written to the church in Corinth: “God is not a God of confusion, but of peace” [1 Cor. 14:33]. The Apostle calls us to be about the same purpose and understanding or as St. John Chrysostom says: “united both in mind and in judgment.” We trust our spiritual improvement to the proven tradition given to us, protected by the lives of the martyrs and through the wisdom and teachings of our forefathers and foremothers. And we follow the proven rubics of the Russian Orthodox Church Outside Russia as our bishops direct. We do not allow or encourage schisms to grow among us as unwanted weeds of conflict sucking away the nutrients that mystically sustain our fellowship. And it is in the practice of all these things that we find oneness and the perfecting of love. It is a sacrifice we make to separate ourselves and our families from the world and to strengthen our bond in spiritual growth and be a valued part of our family here at Holy Myrrhbearers. “For of Him, and through Him, and to Him, are all things: to Whom be the glory to the ages.”[Rom. 11:36] ONE for all, and all for ONE! Of the time I have spent at the beach over the years, the most enjoyable minutes for me have been when we take a walk on the beach. I prefer early morning or late evening walks. I like it when it is a little cooler and the day is beginning with the arrival of the sun casting its rays upon the water, or when the day’s activities are done and darkness will soon cover the sand. I enjoy the seabirds floating gracefully through the air and the sand fiddlers busily scurrying across the sand! And I like to witness the waves continually rolling to shore and the sounds of their motion bring me peace. Even with the crashing of a storm or the retreating of the tide, the waves continue to break again and again. The waves coming ashore always erase the evidence of the past days activities on the sand. If only my prayer life was like waves crashing on the beach, unstoppable, always busily rolling in. I long for that since of stability in my life that I see in nature, the birds glide without effort, the sand fiddlers go about their business and the tide comes and goes. But with the ability to choose God or deny His existence I sometimes find myself thinking I am above His creation. I am in charge! Why does it take a storm crashing upon my feet for me to surrender my will? Were we not made for one thing! After all, everything in creation has a purpose and all of creation, with the exception of we humans, do not get distracted with separation from our Creator! The evil one can provide you with earthly treasure but you will never be truly joyful. There will always be something missing. We will always need the next thing as we continue to chase our tail around in circles seeking our next high! We are created and we are always longing for something. People and things cannot fill that void, there is only way to find true happiness and that stability that we all seek! Listen to the words of the psalmist! (Psalm 148) Praise the Lord! Praise the Lord from the heavens, praise Him in the heights! Praise Him, all His angels, praise Him, all His host! Praise Him, sun and moon, praise Him, all you shining stars! Praise Him, you highest heavens, and you waters above the heavens! Let them praise the Name of the Lord! For He commanded and they were created. And He established them for ever and ever; He fixed their bounds which cannot be passed. Praise the Lord from the earth, you sea monsters and all deeps, fire and hail, snow and frost, stormy wind fulfilling His command! Mountains and all hills, fruit trees and all cedars.Beasts and all cattle, creeping things and flying birds! Kings of the earth and all peoples, princes and all rulers of the earth! Young men and maidens together, old men and children! Let them praise the Name of the Lord, for His Name alone is exalted; His glory is above earth and heaven. He has raised up a horn for His people, praise for all His saints, for the people of Israel who are near to Him. Praise the Lord!